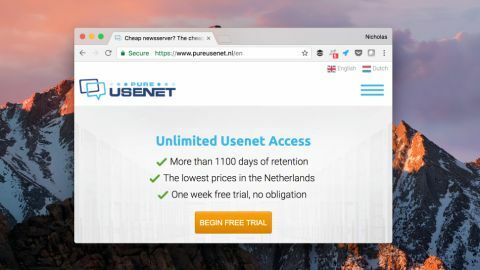 Pure Usenet may not be the most powerful option on the market, but it gets the job done and offers some affordable plans. Pure Usenet is another popular newsgroup service operating from the Netherlands. In an attempt to differentiate itself in a crowded and competitive market, this provider offers a wide variety of packages, decent retention, low prices and quality customer support. Pure Usenet doesn’t disappoint on the performance front. It currently offers 2,000 days of binary retention, and you can access more than 100,000 newsgroups worldwide. This number of newsgroups is impressive, although there are other Usenet services that offer more retention. Astraweb, for instance, comes with over 3,000 days. It’s important to note that this is a Europe-centric service, though. The company doesn’t currently own any servers in the US, and it hasn’t announced any plans to change this situation. Of course, if you happen to be based in a European country, you’ll be fine. The number of connections you get depends on the account you choose, ranging between four and 12. Again, there are better platforms out there – some rival providers offer up to 50 connections. Like the majority of providers, Pure Usenet offers SSL encryption, bolstering security and helping to protect your data. If you’ve not had any truck with a Usenet service before, you needn’t worry, as there’s plenty of help to hand. Common technical questions have been answered in a comprehensive and clearly written FAQ page. Should you run into any problems, you can get in touch with Pure Usenet’s customer service team here. You should hear back from someone within a few working days. There’s nothing worse than software that’s complicated to use, or badly designed. Fortunately this isn’t the case with Pure Usenet – it’s easy-to-use. About the only frustration we encountered with this provider was in terms of the website, with some pages having been left in Dutch. You get a lot of choice in terms of subscription plans and prices. The most affordable package costs €1.83 (£1.60, $2) a month, and for that, you get four connections, a maximum speed of 4Mbps and 2,000 days of retention. This option is basic, to say the least – but it’ll suit people who haven’t used a newsgroup service before. The Medium plan will set you back €3.43 (£3, $3.80) a month, giving you 20Mbps of speed and eight connections. If you want even more, €6.63 (£5.70, $7.35) will get you the XXL plan with unlimited speed and 12 connections. SSL encryption is included with every plan, and you can sign up for a 7-day free trial to see if the service suits your needs. Overall, Pure Usenet is a reasonable newsgroup service. While it isn’t as powerful as some platforms on the market, it’s still an affordable option that gets the job done.